Brainobrain is one of the world’s leading children institutes for self-empowerment. This Program, which is using an old calculating device Abacus, improves brain capacities in children and makes the learning process easier. 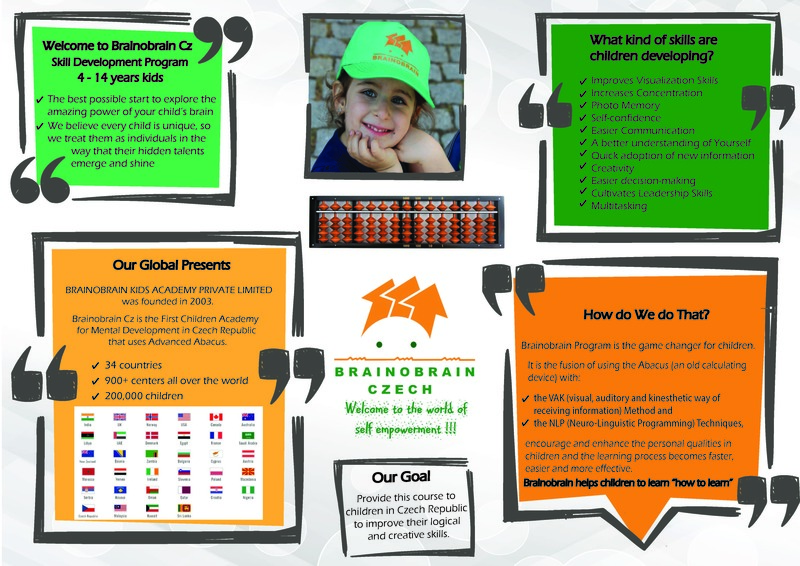 The purpose of Brainobrain is to help children to achieve whole brain development. The Brainobrain children enjoy a greater concentration, powerful memory and they acquire better results with lesser effort. Brainobrain Program helps the children realize their full potential and accordingly develop more skills. After the successful completion of the course, every parent can see the increase in an overall performance of their child. Brainobrain Cz are beginning scheduling for the 2018/2019 school year and we encourage you and your child/children to be an integral part of the first children Academy for Mental Development in Czech Republic , that uses Advanced Abacus. Our Brainobrain Program is getting ready to kick off another exciting three/four month session for children age 4 to 14 years. It comprises of 10 Levels, with each Level having a duration of 3 or 4 months, (depends of the children age). Classes are once for a week for 2 hours. We believe that challenging experiences, facilitated by trained professionals in a safe and supportive environment, can help your children discover their confidence and develop skills for success. This Brainobrain Cz Brochure is intended to give you information about our Brainobrain Program, which we hope you will find useful. Brainobrain Cz aim to provide the best skill development in children, train children to use both sides of their brain. As a parent or guardian, your encouragement in the months leading up to the course can be the key to your child’s success while on course.